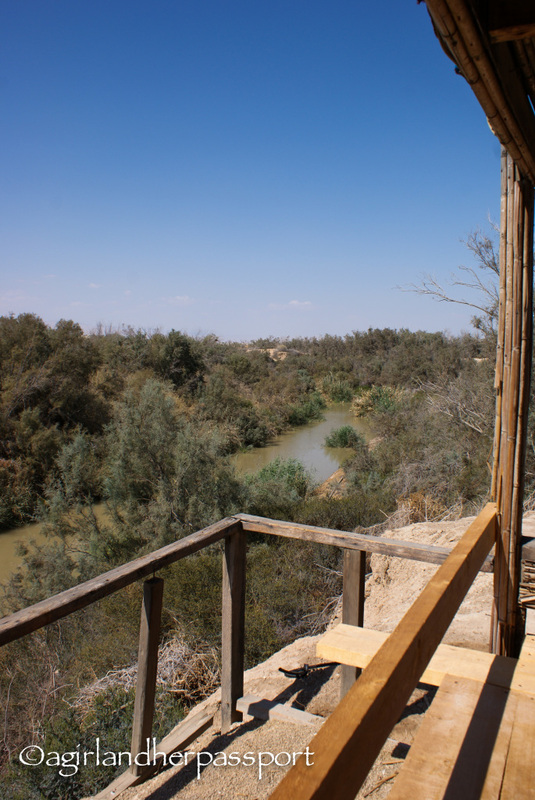 When I was planning my trip to Jordan, I had no idea that the baptism site of Jesus Christ was on the Jordanian side of the River Jordan. So, the day before I was to leave, I booked a tour of the site. I had booked it so last-minute, I had a private driver and tour guide. I felt very well-to-do! It made me laugh to myself as I felt a bit silly. The drive from my hotel in Amman to the Baptism Site is probably about 30 minutes, but the tour guide was showing me things along the way and it took about 45 minutes. Once we arrived, there were very few people at the site and there was no one on the Israeli side at all, not even any staff. Jordanian tourism has suffered from the wars in Syria and Israel. I never saw any signs of bombs or attacks and I never felt unsafe while I was there. There are many things to look at on the walk out to the actual baptism site and much of the way is covered, however, even in October it was hot. 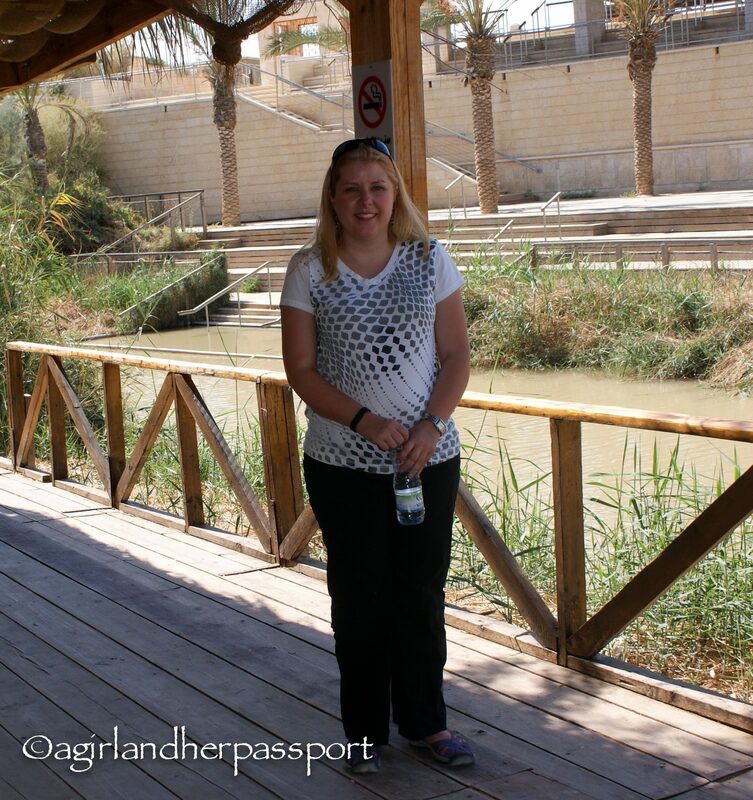 You can see my red face in my picture in front of the River Jordan! There are several beautiful mosaics along the way and many of these are modern additions to the site. Then you get to the actual site, which isn’t on the River Jordan anymore because the river has been reduced to a small creek from the water being diverted for farming. There are several ruins of churches on the site. 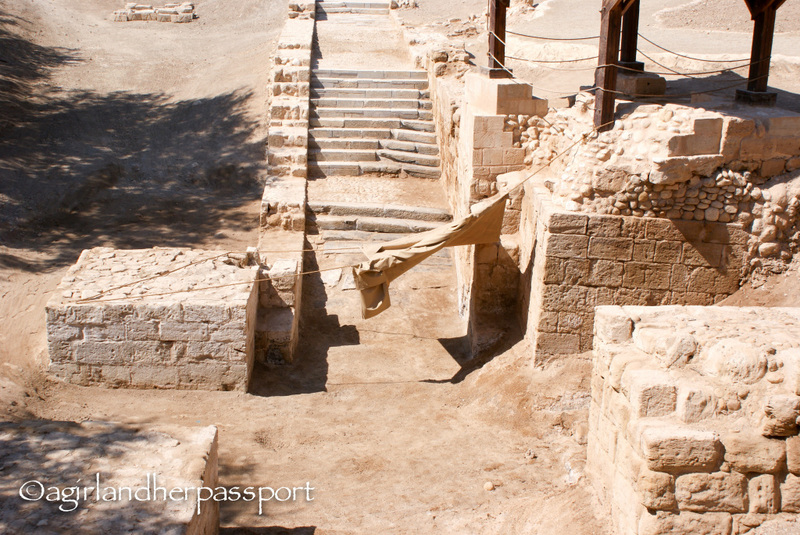 In the pictures below you see a set of stairs leading down to a lower area and that is the baptism site of Jesus Christ. If you go to the website, you can see it filled with water. 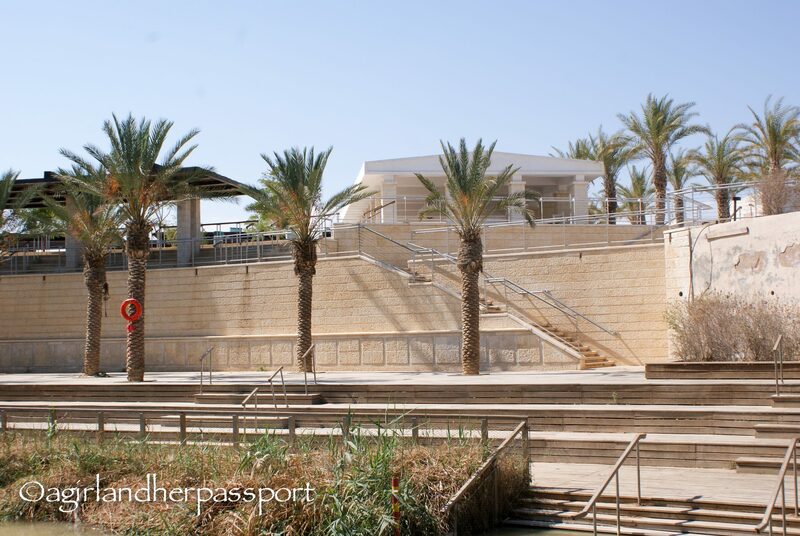 You can then head down to the river and actual be baptized in the River Jordan. I think you have to get permission and bring your own clergy though. The river looked a bit gross though as I could see mosquitoes in the water. I did put my hand in it though and it was cold! The river flows down from the mountains and is still cold at this point. Several denominations of Christians have built churches at the site. The one I went into was the Greek Orthodox church and there is a picture below of the outside. It was beautiful both outside and in. There was beautiful mosaic tile work on the floor. 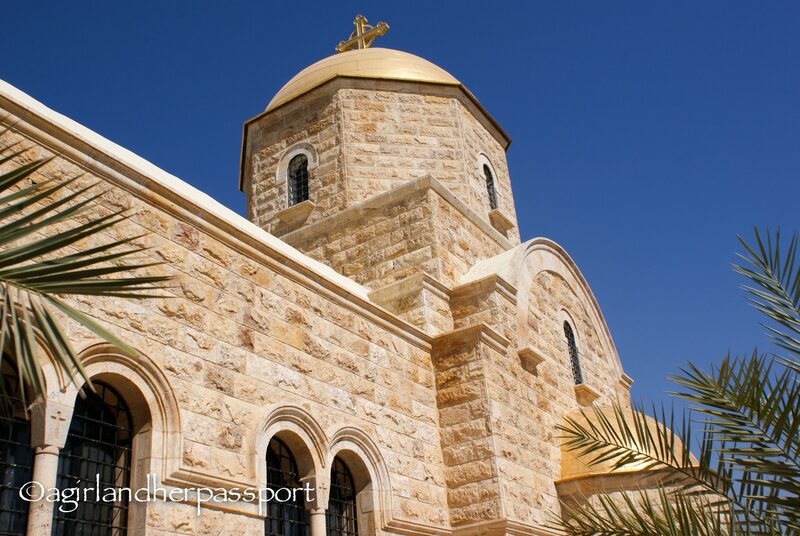 The next day, I met up with the next tour guide and headed to Madaba, Mt. Nebo and the Dead Sea. 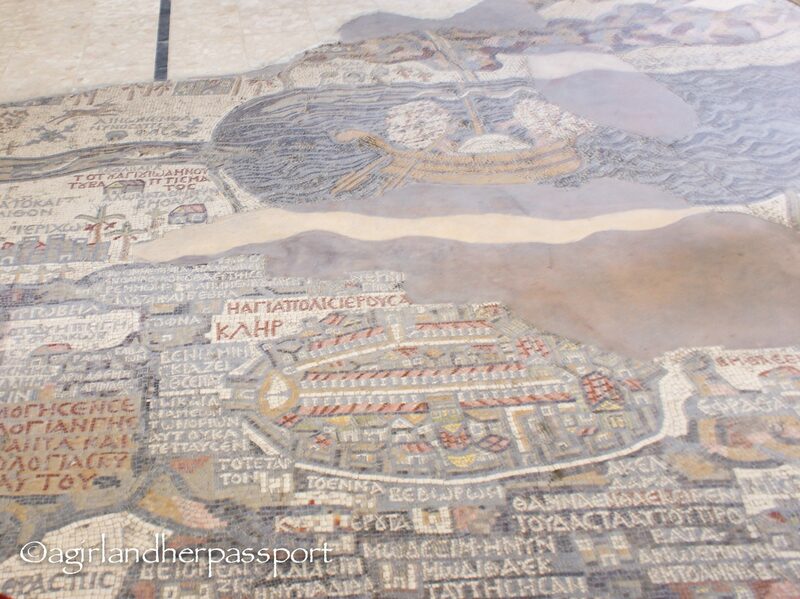 In Madaba, I went to see the oldest known map of the Holy Land. Not only is it the oldest, it is also a mosaic! The map is the floor of a church built in the 6th century. It was rediscovered in 1884. The mosaic is impressive as it is large and very detailed. They are doing their best to preserve what is left of the map. 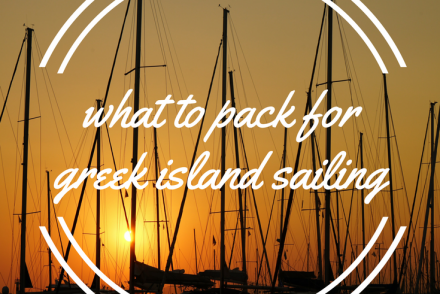 It is located in the Greek Orthodox Church of St. George. Next, I headed to Mt. Nebo. 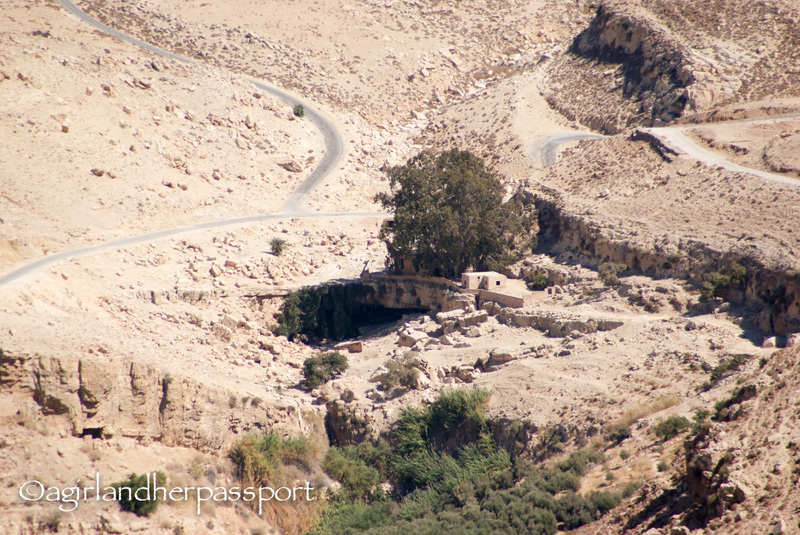 This is the place the Moses saw the Promised Land for the first time. On a clear day you can see Jerusalem. It was not a clear day and I could not see it. 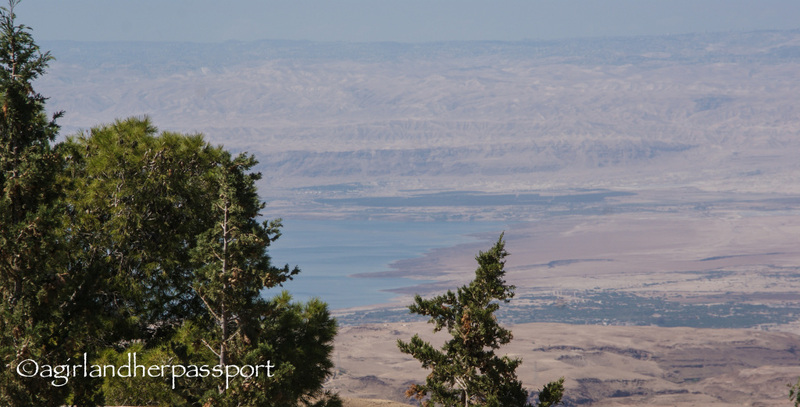 You could see parts of the Dead Sea and the Jordan River Valley. It was inspiring to be there and to see what I have been hearing about since I was a baby. Since the River Jordan was more freely flowing, I am assuming it would have been more green and much more beautiful than it was the day I was there. On the way up the mountain, to the right hand side, my guide pointed out a small house structure with a tree. My guide says this is where Moses got water from a rock and the spring still flows. I don’t think this is confirmed and there was no signage, but it does look like an oasis in the land of sand. We were now going to drive to the Dead Sea. I didn’t take too many pictures as I was afraid the salt might get into the camera. I have to say, I wasn’t impressed with the Dead Sea. It could have been that I was at the public beach and not at one of the resorts. I was glad that I didn’t spend lots of time there. When I got in, it stung! I have very sensitive skin and if you have any scratches or wounds it will hurt like the dickens! They do have showers up on the hill to rinse of with and further up the hill there are restrooms will better showers and changing areas. Keep that in mind when you getting in. I would say that if you are staying in a resort, it might be nicer, but basically it was a big salty lake! I am now interested about Jordan, thanks for your post. Hubby was there a few months ago on business as usual. It was beautiful. You would like it.